The Professional Jockeys' Association (PJA) said it was concerned about the way the BHA handled the case. "Today is about Richie being exonerated, and we will therefore raise those concerns directly and privately with the BHA," said Paul Struthers, the PJA's chief executive. The investigation related to 57 races between October 2009 and July 2012. Seven people were named when the BHA charges were revealed last September, including former trainer Kate Walton. The charges against Walton and four other unlicensed individuals were, however, dropped a week before they were due to face a disciplinary inquiry. McGrath and former owner Mark Aspey went before a BHA disciplinary panel in March, but they have both now been cleared of all corruption charges. 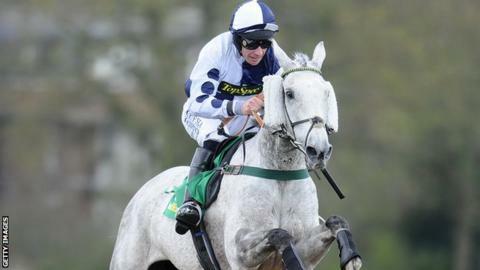 The jockey has instead been found in breach of a far lesser offence, that of giving a horse "a schooling run" aboard Rumble Of Thunder at Fakenham on 1 January, 2011. McGrath has not ridden in public since he suffered a back fracture in a fall at Hexham in March 2014. "We are delighted that Richie McGrath has been found not guilty of all the charges he faced, with a minor exception for which there should hopefully be no penalty," added Struthers. "Even though Richie has maintained his innocence throughout and was always hopeful of this outcome, it has still been an incredibly stressful and difficult time for Richie and his family and he can now start to rebuild his career, injury permitting." A BHA statement said full reasons for the panel's findings will be published "in a few days" and that it will "consider submissions as to how penalties - if appropriate - will be dealt with".